is a genus of 56 species of annual and perennial mostly herbaceous plants in the sunflower family (Asteraceae or Compositae). The name Tagetes is from the name of the Etruscan Tages. 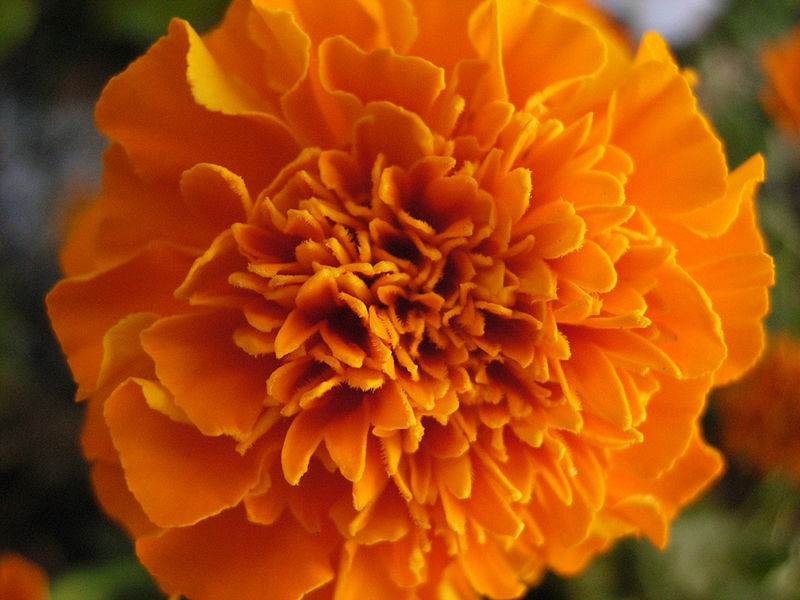 The common name in English, "marigold", is derived from "Mary's Gold", a name once exclusively applied to Calendula. In Nepal it is called 'शयपत्री' that means hundred leafed flower, referring to its many florets per head. The marigold is also widely cultivated in India and Thailand, particularly the species T. erecta, T. patula, and T. tenuifolia. 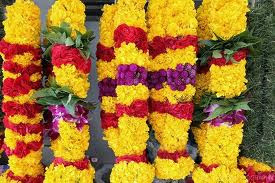 Vast quantities of marigolds are used in garlands and decoration for weddings, festivals, and religious events. Marigold cultivation is extensively seen in Andhra Pradesh, Tamil Nadu, West Bengal, Karnataka, and Uttar Pradesh. Calendula, which goes by "marigold" in some areas. Click for more flower garlands from India.
. karenjura カレンジュラ Calendula officinalis .
. Marigold (Peacock plant) kujakusoo　孔雀草 . Marigold flowers are used in all kinds of ceremonies in India, from weddings to funerals. They have a prominent place in Hindu culture. They are made into garlands, used to decorate temples as well as the biers. They are inexpensive and easily available almost year round. doli is hindi word for a palanquin or any vehicle in which the bride departs for her husband's home.